All of the NRK studios across Norway are using the same set up because it works so well. Erling Johnsen, Technical Manager at NRK. Panasonic AV technology is used extensively to create excellent meeting spaces and welcoming communal areas. 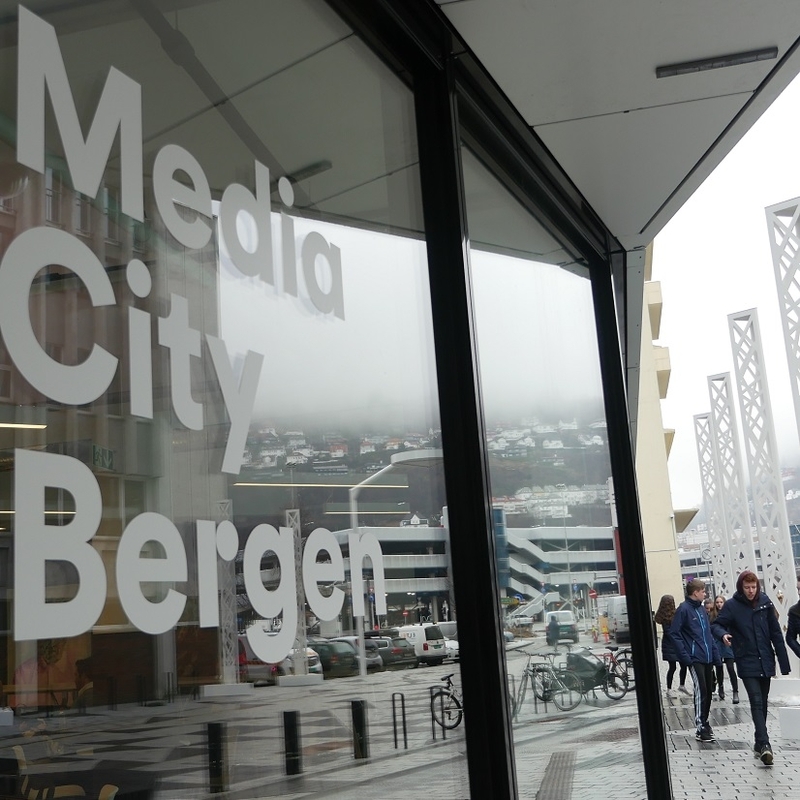 Media City Bergen is a knowledge and business hub that hosts a collective of media technology companies, educational and research communities, as well as two media houses under one roof in Bergen city ​​centre. The building, developed by Entra property, is the first project of its kind in the Nordic region. 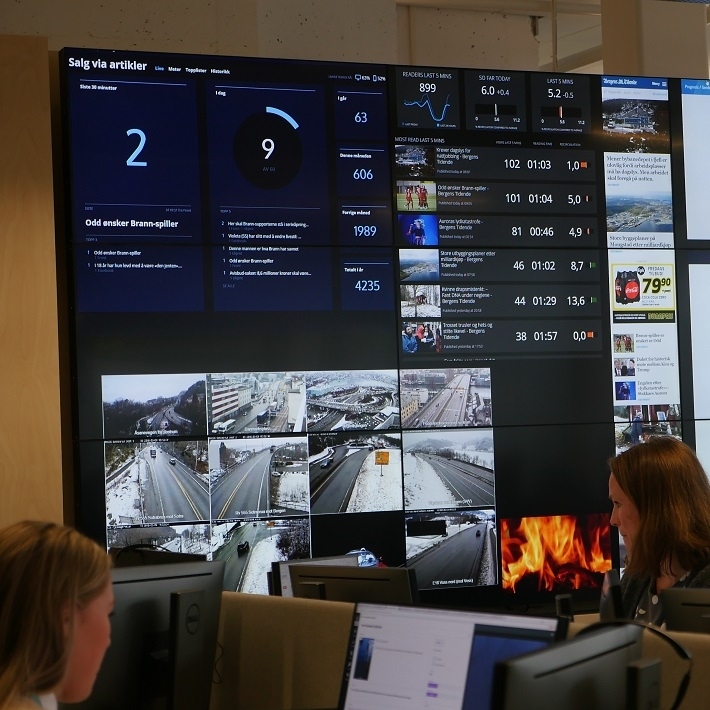 Completed in 2017, it houses about 1,200 media people including the TV channels TV 2 and NRK, the graphics company Vizrt, the media houses Bergens Tidende and Bergensavisen and the University of Bergen. It follows the successful model of Media City in Salford, UK where the BBC and ITV share facilities, reducing production costs for both organisations. 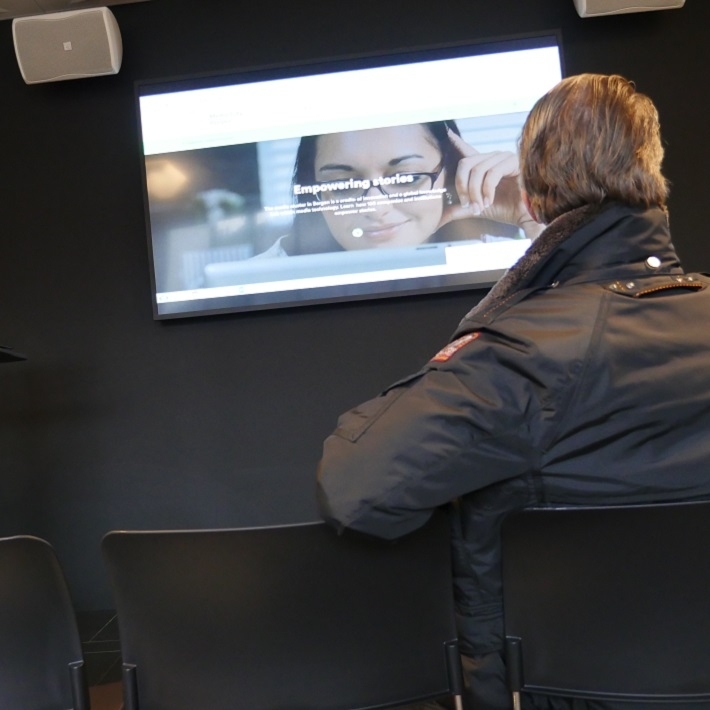 Panasonic technology is prevalent in communal spaces, used for registration, meeting spaces and for a large statement projection in the main foyer. In addition, Bergens Tidende and NRK make use of a range of Panasonic technologies in their dedicated spaces within the building. Five TH-65BF1 interactive touch screen LED backlight flat panel displays welcome new visitors to the building, guiding them through a sign in and welcome process and informing their hosts of their arrival. Specifically designed for such applications, the displays have a protective glass providing extra security against impact. This insurance is invaluable in public spaces, while an improved anti glare screen treatment scatters reflected light from overhead illumination to reduce glare and improve all-round visibility. In the basement of the building there are 11 meeting rooms. Integrated by by AV-Teknikk and Kinly, each is equipped with TH-65LFE8 displays. Auto sensors instantly recognise a new HDMI input, switching the displays on for immediate start up. A booking system for the rooms, showing live availability is displayed on two TH-55AF1 displays in the communal reception space for the meeting rooms. For larger group meetings, the ground floor canteen has a 5,400 lumens PT-RZ570 laser projector with a retractable screen in the ceiling. 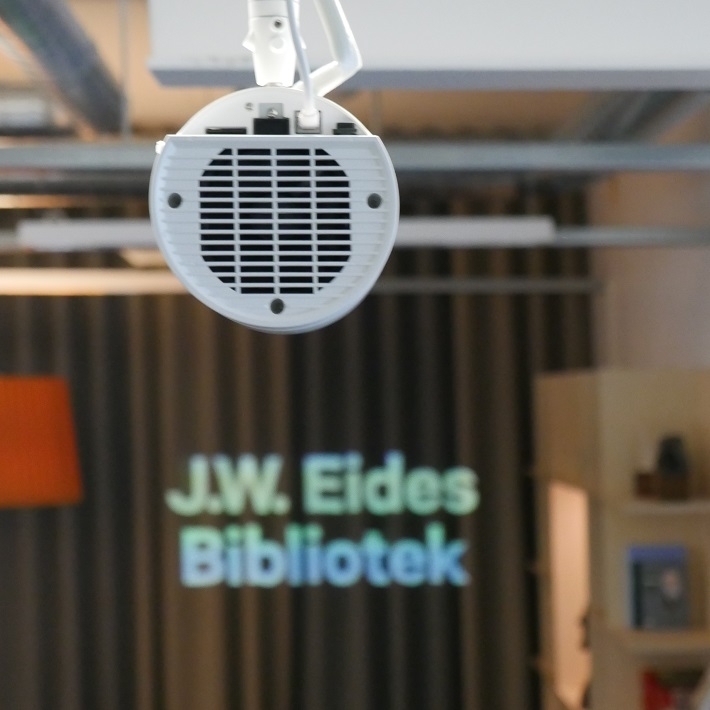 Lamp-less and filter-less, the projector has been designed to significantly reduce routine maintenance, so no maintenance is required for the first 20,000 hours of operation. A 30,000 lumens PT-RZ31K laser projector provides statement projections in the main entry vestibule. The PT-RZ31K Series combines 3-Chip DLP™ with proprietary SOLID SHINE laser technology for brighter and immersive visual experiences. 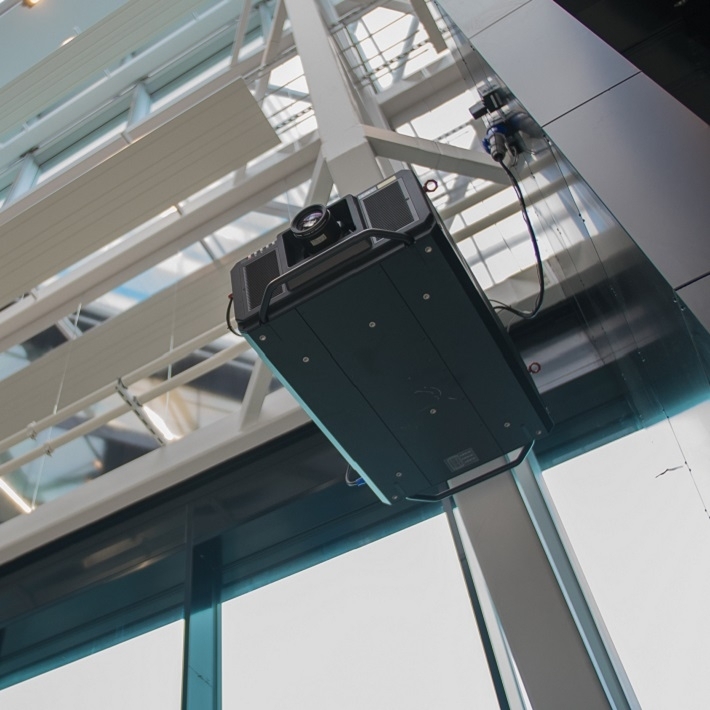 Designed for convenient and flexible on-site installation, along with a range of advanced features that promote lower cost of ownership, this projector produces magnificent image quality in large venue applications. Finally, a common press conference room, off the main vestibule, is equipped with an TH-84EF1. Powered by a Crestron room controller the 350 cd/m2 brightness, high-visibility IPS Panel makes images easier to see and boosts the signage effect. The regional radio studio for national broadcaster NRK based at Media City Bergen broadcasts local content at various times during the day. Meeting a demand for high quality images to accompany the speech, NRK has installed four remote cameras within the studio so that programmes can be broadcast live on the NRK website. K1 studio is used regularly for live music and the four AW-HE130 Full HD remote cameras stream this live, so that listeners are able to have a more complete experience. The AW-HE130 is equipped with an innovative x1.4 digital extender that can increase the effective focal length of the lens by 40% while delivering smooth, high resolution video. “The four cameras used in K1 studio are used for live streaming. I really like the camera, they’re easy to use. What’s critical in a radio environment is that they are virtually silent, even in fast pan and tilt,” says Erling Johnsen, Technical Manager at NRK. “We are using PoE+, for power and control, with an SDI out for the HD signal. All of the NRK studios across Norway are using the same set up because it works so well. Regional travel bulletins are also broadcast live from Media City. A user operated travel desk is situated in the main NRK reception area. The presenter is able to adjust the camera position using a control panel to move the dolly. Panasonic remote cameras film the broadcast and bring external images live to a Panasonic display behind the presenter. 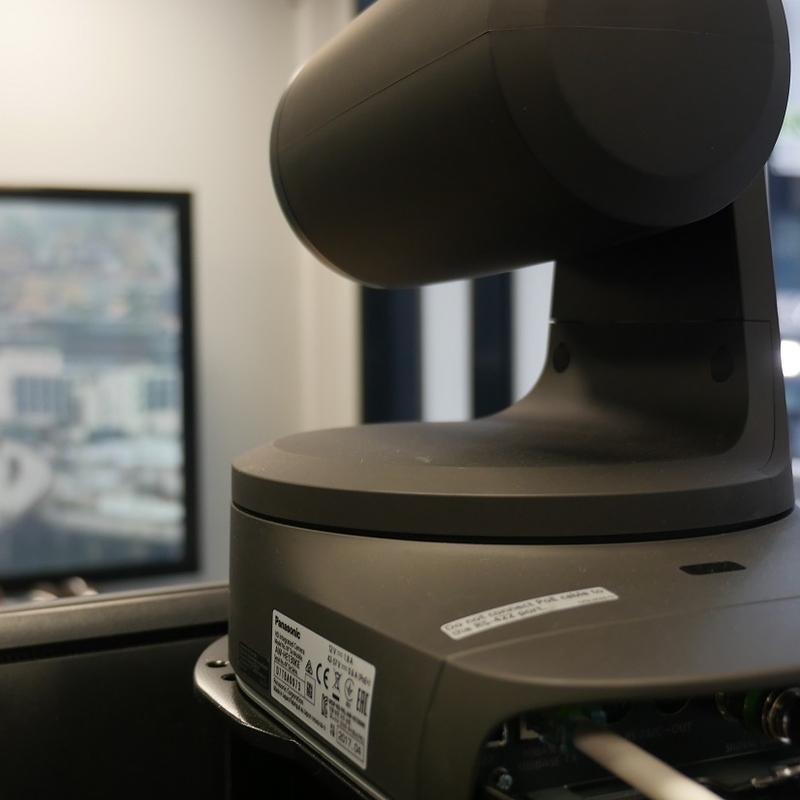 “We have a AW-HR140 camera on the roof, so that the team can zoom in on known travel hotspots throughout the city. 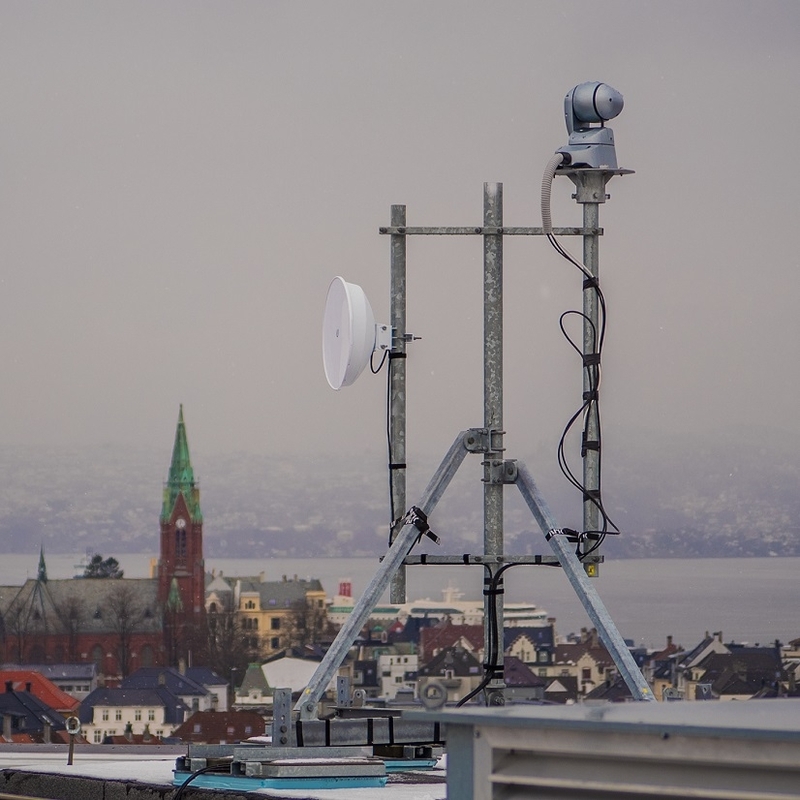 The broadcasts are user operated and filmed using an AW-HE130,” says Erling Johnsen, Technical Manager at NRK. The HR140 is IP65 rated and offers resistance to wind speeds of up to 50 m/s without damage to the camera. Aluminium and other metal parts are coated to protect against salt damage. The camera is also coated with resins that give excellent heat resistance.​ Thanks to a defroster, the glass does not get frozen at low temperatures down to -15ºC (5°F), not uncommon in the Norwegian winter. Even in blizzards, snow that hits the glass surface melts off to maintain visibility. If necessary a lens wiper is included to keep the lens clear in harsh environments. An AW-RP120 remote camera controller is used in the production gallery to control the feed from the roof mounted AW-HR140. Using various presets the camera is able to quickly transition from various known traffic hotspots across Bergen, allowing single-person operation. Bergens Tidende is Norway's fifth-largest newspaper, and the country's largest newspaper outside Oslo. With a circulation of around 70,000, the newspaper celebrates its 150th birthday in 2018. While the newspaper has significant history, it’s new offices within Media City Bergen are anything but old. Panasonic technology plays a vital role in ensuring the newspaper continues to play a leading role in bringing news to the people of Bergen. Integrated by AV-Teknikk and Kinly, a total of 22 TH-49AF1 displays are installed in ceiling mounted brackets across both the sales and editorial floors. Incorporating a System on a Chip, the OpenPort PLATFORM™ display series is designed for commercial signage applications and features an Android™ and HTML5-based open source platform. There are a total of six casual meeting spaces, where comfortable, modern seating is matched with 42 inch TH-42AF1 displays for simple sharing of content and presentations. 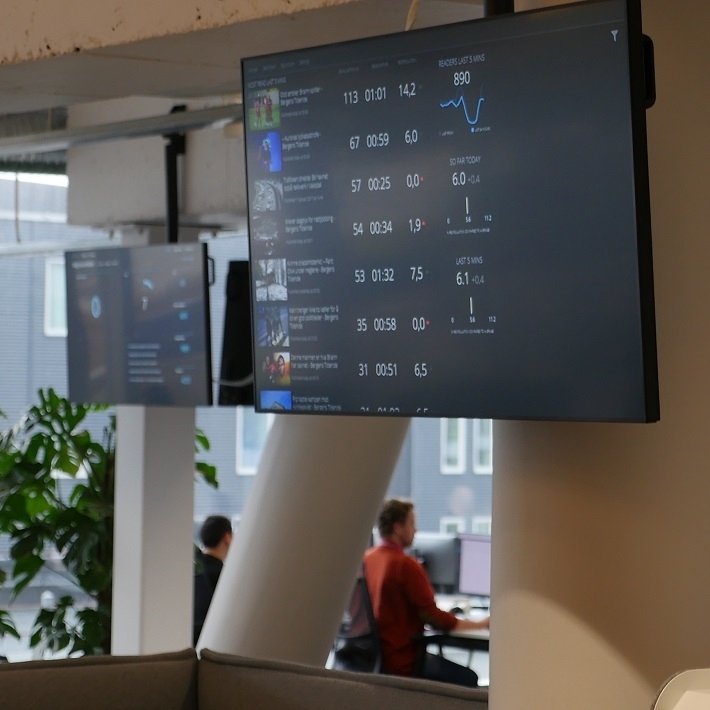 The newspaper has also installed two nine screen video walls, one as a focal point withing the editorial floor, with a second in a communal chill-out space. The video walls are constructed using TH-47LFV5 videowall displays. With a super-narrow bezel with joints that are only 5.3 mm wide, it means that screen borders can barely be seen, even in large-screen configurations. Nine SpacePlayer™ hybrid lighting projectors are installed throughout the Bergens Tidende offices. These are used for wayfinding, signage and to create a more engaging work space. Tormod Åsen said, “In the kitchen area we are using the SpacePlayer to project on to the floor, reminding staff to put their cups away at the end of the day. It’s obviously a more engaging way of doing that than having a piece of A4 paper taped to the cupboards.